Great pair of early Art Deco Tutti Frutti style and fashion multicolor gemstone cufflinks. 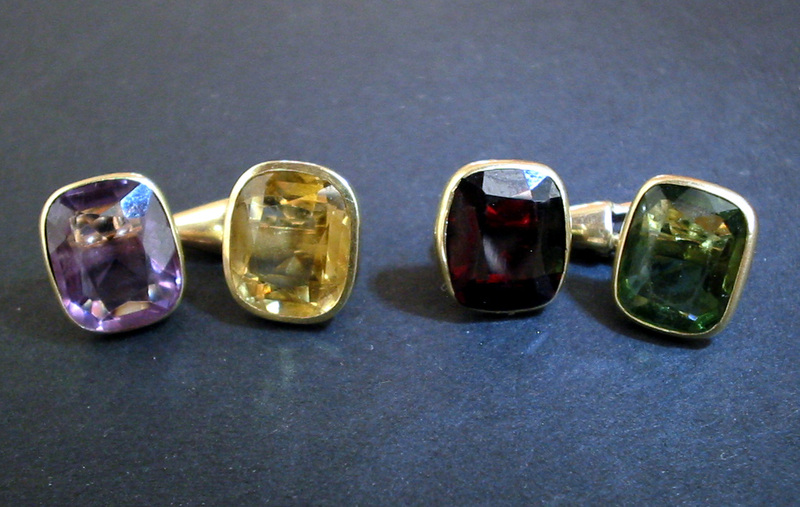 Each cuff is set with a single large natural gem into 14 karat yellow gold. All gems measure approximately 11mm x 9mm x 5.5mm and have an estimated weight of roughly 3.5 carats each. The gem stones used are perfect examples of natural and untreated Peridot, combined with a fantastic rich color and great clarity Garnet within the first pair, and the second pair has an amethyst and citrine stones. Each pair can be changed to match the other stone, as stones are hooked in an interchangeable manner. This fantastic example of antique men's cuffs have multiple hallmarks and maker's marks and appear to be of Austrian origin and manufacture. Gross weight of the set is 7.8 in 14 karat gold. Absolutely scarce antique jewelry / jewellery collector set and one of the great European master crafted Art Deco and Tutti Frutti fashion gents cufflinks and jewels / accessories.